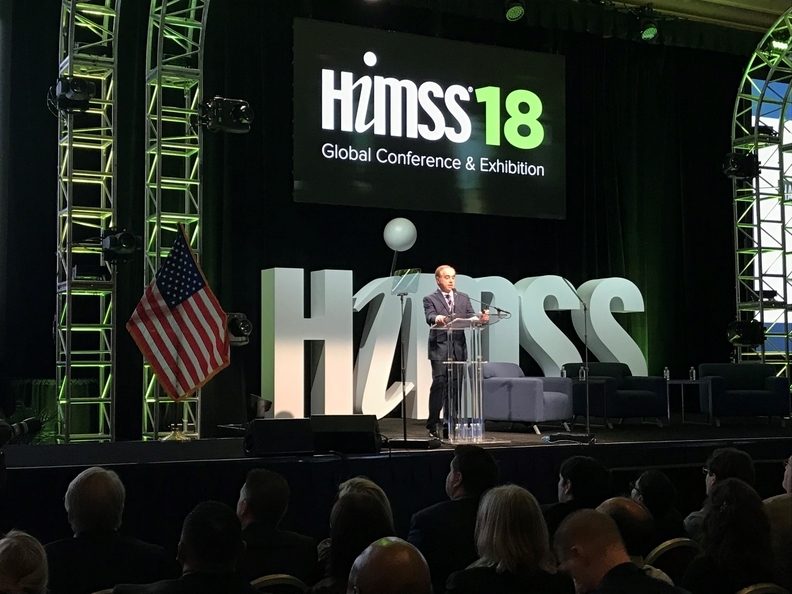 LAS VEGAS—Veterans Affairs Secretary Dr. David Shulkin called on providers and health information technology vendors Friday to commit to working on a set of standards aimed at breaking the interoperability logjam. Speaking at the Health Information and Management Systems Society's annual meeting, Shulkin said the VA is developing a set of common data standards for collecting patient information. The department is also testing an open-source API platform that would make it easier for electronic systems to speak with one another. Both are important for the VA as it works to create interoperability with the Defense Department and as more veterans seek care from community providers. "We are asking industry to open up API access to all developers who want to work with veterans," Shulkin said. "And stop the practice of information blocking." The VA last year offered a no-bid contract to Cerner, estimated to total $10 billion, to scrap the department's 130 existing systems and convert them to a single platform. Shulkin has delayed signing the contract, however, due to what he said were concerns over interoperability. "We've been working to get this issue of interoperability correct," he said, adding that over the past three months the VA and its industry partners have made progress. Shulkin added that the no-bid contract was used to jump start work on interoperability rather than having to deal with a lengthy government procurement process. Shulkin was effusive his support of developing common data standards and the open API structure. Through a new initiative the department unveiled earlier this week at HIMSS18, the VA has already come up APIs for a handful of categories, including allergies, scheduling and patient medications. To date, 11 health systems signed a VA pledge committing to the open API. Shulkin said that organizations need to be prepared to fully support the pledge before signing on because they are agreeing to share data and put aside their competitive differences. "I don't want this be be group think," Shulkin said in an interview following his speech. "We have a very specific set of actions and we want organizations that are committed to that." One of those key actions, to stop blocking data, is something that the CMS and Office of the National Coordinator officials are targeting as well. ONC is in the process of promulgating a rule on data blocking, which was mandated under the 21st Century Cures Act. Shulkin said the VA will work with ONC, but in some cases it may get out ahead of the office. "When it comes to common data sets, there can't be anything that interrupts the data flow," he said. Just because the VA builds it doesn't necessarily mean that the patients—and their data—will come. Currently, veterans are required to sign a form in person that authorizes the VA to share data with community providers. According to a report from the Sequoia Project, just 4% of veterans have done so. Shulkin said that 36% of veterans receive care from community providers. The VA and Congress need to address this issue and likely make it an opt-out process, Shulkin said. But he will not push for that change in the VA Choice legislation that is currently making its way through Congress. Shulkin's appearance on the last day of the mammoth IT conference comes as the VA secretary is trying to right a ship following the release of a scathing report by the VA Office of Inspector General. The department's investigative watchdog found that the VA's flagship facility, Washington Medical Center, has been plagued by poor management and quality control. The OIG said the medical center consistently failed to meet quality of care, fiscal and management standards. Problems with equipment led to excruciating situations described in detail, such as a skin grafting procedure that had to be done manually and led to the graft not adhering. "The dysfunctions identified at the medical center were prevalent and deeply intertwined," the report stated. "They could not be attributed to any single individual, but rather were the result of inadequate actions and accountability across many services and positions. The OIG encountered a culture of complacency among VA and Veterans Health Administration leaders at multiple levels who failed to address previously identified serious issues with a sense of urgency or purpose." Shulkin on Wednesday announced plans to overhaul management at the Washington, D.C., medical center, as well as in the department as a whole. Among other things, he said there would now be unannounced visits to VA medical facilities by outside auditors. He said he is restructuring the VA's central office and setting up a new governance oversight for medical centers, as well as holding VA-wide staffing reviews and "decentralizing" accountability. And he's not done. During the interview, Shulkin said he has directed the department to develop plans to overhaul both the central office and VA's care networks. Those reports are due to the secretary May 1 and July 1, but Shulkin said he is prepared to act sooner. Shulkin said the OIG findings point out how critical it is for information to be shared across the organization, noting that he was made aware of the problems at Washington Medical Center when he was undersecretary of health and he acted quickly after that. "I'm here to fix problems," he said. "I can't fix it if I don't know."